We buy gold, guns, and more! 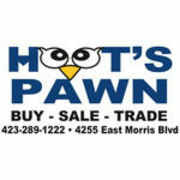 Rate and review Hoot's Pawn Shop in Morristown, TN, United States! Share your experiences at Hoot's Pawn Shop with your friends or discover more Pawn Shops in Morristown, TN, United States.